We consider node-weighted network design problems, in particular the survivable network design problem (SNDP) and its prize-collecting version (PC-SNDP). The input consists of a node-weighted undirected graph G = (V,E) and integral connectivity requirements r(st) for each pair of nodes st. The goal is to find a minimum node-weighted subgraph H of G such that, for each pair st, H contains r(st) edge-disjoint paths between s and t. PC-SNDP is a generalization in which the input also includes a penalty π(st) for each pair, and the goal is to find a subgraph H to minimize the sum of the weight of H and the sum of the penalties for all pairs whose connectivity requirements are not fully satisfied by H. Let k = max st r(st) be the maximum requirement. There has been no non-trivial approximation for node-weighted PC-SNDP for k > 1, the main reason being the lack of an LP relaxation based approach for node-weighted SNDP. In this paper we describe multiroute-flow based relaxations for the two problems and obtain approximation algorithms for PC-SNDP through them. 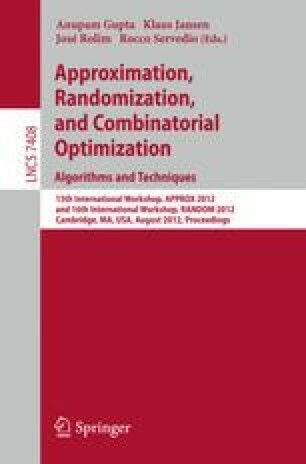 The approximation ratios we obtain for PC-SNDP are similar to those that were previously known for SNDP via combinatorial algorithms. Specifically, we obtain an O(k 2 logn)-approximation in general graphs and an O(k 2)-approximation in graphs that exclude a fixed minor. The approximation ratios can be improved by a factor of k but the running times of the algorithms depend polynomially on n k .
Partially supported by NSF grant CCF-1016684. A longer version containing the omitted proofs will be made available on the authors’ webpages.